From a wheelchair built using Formula One techniques to a swimming cap that tells blind swimmers when to turn via a smartphone, technology and sport have come together in a major way in the Rio Paralympics. The technology has enabled these sportspersons to challenge, and even out-compete, their able-bodied counterparts. Last year, German long jumper Markus Rehm set a world record that would have comfortably won him gold in the Rio Olympics. 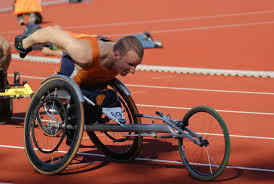 He is hoping to compete alongside non-disabled athletes at the World Championships in London next year. With 3D printing, athletes can get customized fittings that allow those with impairments to better distribute their muscle power.